The outline of Greece's new deal with creditors began to emerge after heads of Eurozone governments ended 17 hours of talks on Monday morning. The European Stability Mechanism, a government distress fund set up after the 2008 crisis, will consider a third, €82-86bn euro bailout loan to Greece. The European Commission will disburse a €35bn development fund to Greece. The European Central Bank will shortly consider renewing flows of liquidity to help Greek banks re-open their doors after two weeks of closure and capital controls. The single currency area’s finance ministers’ forum, the Eurogroup, will consider a rescheduling of Greek debt after successful completion of the first review of the new programme, i.e. in the autumn. 1. Greece has to pass additional “up-front” measures by Wednesday to qualify for the deal. We’re waiting to hear what the cost of those measures will be. 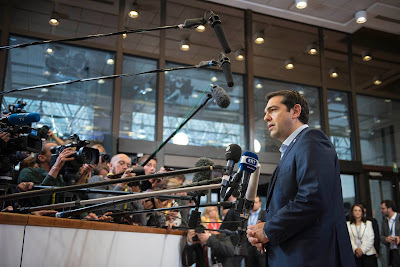 Syriza is likely to pass them with the help of the socialist and conservative votes, which have already been pledged. Similar opposition support gave it a vast majority of 251 votes in the 300-seat legislature when it passed a package of austerity measures on Saturday; but now it could suffer larger defections, prompting an election. Party whip Yannis Balafas said the party was "in a state of division". Labour Minister Panos Skourletis in fact declared on Monday that a 2015 election was likely. This makes sense. Syriza needs to do its house-cleaning at some point. Cabinet members and MPs who oppose any deal with the Eurozone will have to carve themselves away from the party, leaving Prime Minister Alexis Tsipras to move it closer to the political centre. Syriza won 16pc of the vote in May 2012, 26pc in June 2012, and 36pc in January this year. It needs to hold another election and win single-party rule before its numbers stop climbing. Recent opinion polls have placed it in the high 40s. 2. Immediately after the deal is sealed, Greece must “scale up” its privatisation programme from the current €11bn to €50bn euros. This is a massive undertaking, and both politically and practically difficult, and its success is highly doubtful. Greece’s first bailout loan, in 2010, contained such a provision. The government was careful to keep it under wraps, rightly fearing outrage. When creditors made it public in a press conference in early 2011, then-finance minister Yiorgos Papakonstantinou was so outraged that he forbade them from ever holding another press conference on Greek soil. The objections came from both voters and politicians. Either the state would be denuded of regulatory bodies and infrastructure taxpayers had funded over decades, they opined, or such massive amounts of public land would have to be bundled, securitised and sold in the plan’s two-year period, that the sales would depress real estate prices and destroy the value of the collateral held by banks against mortgages and other non-performing loans. The banks had just suffered a collapse of the value of Greek government bonds they held at the time, and had required recapitalisation. The land selloff would repeat that trauma. 3. Half of these privatisation proceeds must go to the ESM in repayment of debt, and the other half to recapitalise the banks. But Greek taxpayers have already spent €50bn recapitalising banks. Contrary to arrangements in Spain and Portugal, banks are not held accountable for the repayment of this money but the state, i.e. the Greek taxpayer. This has added to the national debt and helped make it unsustainably large. With the new arrangement, the banks would cost taxpayers €75bn. Tsipras is to table two things on Wednesday - the new agreement reached today, for an €82-86bn loan from the ESM, and a set of specific upfront actions. Both must be voted on by midnight on Wednesday. The upfront actions we understand to be a) establishment of a Fiscal Council and a law that introduces automatic spending cuts when deficits are incurred, b) establishment of the legal independence of the Hellenic Statistical Authority, c) streamlining of VAT (presumably meaning moving more products and services to the highest bracket of 23pc), d) measures to improve the sustainability of the pensions system. By July 22 he has to pass a) a Code of Civil Procedure, b) a bill harmonising into Greek law the BRRD (Bank Recovery and Resolution Directive - the common set of rules whereby Eurozone banks are either wound up or refinanced). These are the six upfront measures. There's a lot more that has to be done 'immediately', which probably means the first quarter of the new agreement. There will be a Eurogroup conference call on Wednesday after the two documents have been tabled in parliament, and that will be the "trigger" for other national parliaments to start their procedures. Also on Wednesday, the European Central Bank is to hold its regular Executive Board meeting, which is expected to decide to release further liquidity to Greek banks, enabling them to re-open. A Monday meeting kept it at the standing level, pending Wednesday's vote.